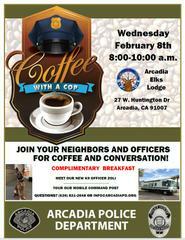 Join your neighbors for coffee and conversation with members of APD on Wednesday, February 8th, at the Arcadia Elks Lodge. And, you can enjoy a complimentary breakfast courtesy of the Elks. Meet K9 Officer Zoli with his handler, Officer Foulks. For more info, call 626.821.2648.